However, we see different tag lists for the command line git filter versus the plugin filter. Git Command: git tag -l "MTRS-MBP-*"
The plugin appears to behave as though "*MTRS-MBP-*" is implied. Yet, we have other entries, like "CDR_MTRS-MBP-v01.00.00_Demo", that the plugin does not show. The expectation here is that the behavior of the filter follows the stated 'git tag -l' behavior. git ls-remote -t git@github.com:klimas7/Learn.git "v*"
git ls-remote -t git@github.com:klimas7/Learn.git "refs/tags/v*"
I tried the updated plugin. Thank you for the adjustments and functional explanation. I fully realize that there are limitations to how the standard "git ls-remote -t" works. Your suggestion to prepend "refs/tags/" to the match helps with one of our job config cases. However, it does not help with our need for a "refs/tags/*-MBP-*" match in other cases. The wildcarding picks up the extra "release/" still. I believe that I saw another ticket/request for a regex style filter for the tags. Given my use case and other user cases, you may want to consider it as a future enhancement. Thank you again for the adjustments/update for this ticket. Kevin Bowen added a comment - 2019-02-20 16:57 - edited I tried the updated plugin. Thank you for the adjustments and functional explanation. I fully realize that there are limitations to how the standard "git ls-remote -t" works. Your suggestion to prepend "refs/tags/" to the match helps with one of our job config cases. However, it does not help with our need for a "refs/tags/*-MBP-*" match in other cases. The wildcarding picks up the extra "release/" still. 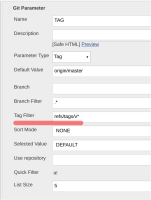 I believe that I saw another ticket/request for a regex style filter for the tags. Given my use case and other user cases, you may want to consider it as a future enhancement. Thank you again for the adjustments/update for this ticket. After update plugin to 0.9.9, the field Filter is disabled when Quick Filter. is checked. Anyone have this problem ? mouz added a comment - 2019-03-11 16:06 After update plugin to 0.9.9, the field Filter is disabled when Quick Filter. is checked. Anyone have this problem ? We are running in production with the updated 0.9.10 version and have not noticed and problems. Kevin Bowen added a comment - 2019-03-11 16:10 We are running in production with the updated 0.9.10 version and have not noticed and problems.